My grandpa was awesome. He was kind, and sweet and loving. He was hardworking, and honest and he loved me. Because I don't really have a dad, he was there for me, and he wasn't even my blood. Blood though, isn't as important as love, and he did love me, and I loved him. He passed away over 10 years ago, and I think of him all the time, Especially with my oldest son Xander. Xander would have loved him, they have so much in common. I wish I could have one more Grandparents Day with him to tell him how much I love and miss him. If your grandparents are still around, you can get them this awesome gift basket from GourmetGiftBaskets.com and show them how much they mean to you. Delivery dates as early as tomorrow! Special people deserve special gifts! That's why, for Grandparents Day, we created this gorgeous arrangement that's full of irresistible gourmet foods. 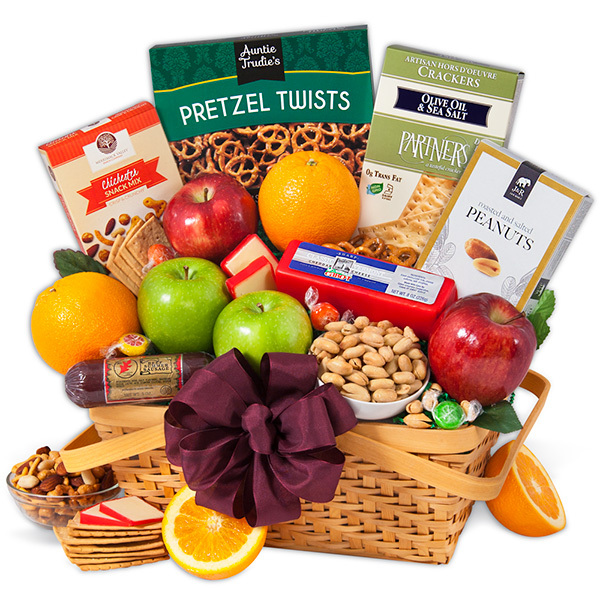 Inside a classic picnic basket is an artful arrangement of fresh orchard fruits, classic Vermont cheddar cheese, and artisan crackers, creating a thoughtful gift that's perfect for showing your grandparents just how much they mean to you! Deli Style Hors D’Oeuvre Crackers by Partners - 2 oz. Beef Summer Sausage by Bavaria - 5 oz. That's a great gift for a great price, and be sure to look for the popup on the website that will save you 15% on your first order!